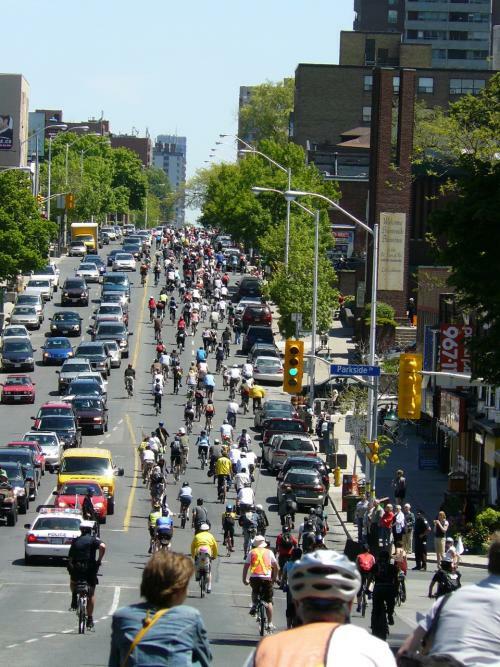 The following event announcement comes from the Clean Air Partnership, who along with TCAT put together the recent study about bike lanes on Bloor St. in The Annex. Please note that registration is limited to 40 people, so you should register soon if you plan to attend. Is your community considering investing in its public realm through an improved pedestrian environment or increasing transportation options through the installation of on-road bike lanes? Often, such proposals involve removing some on-street parking and are met with opposition from merchants who fear that the reallocation of road space would hurt business. A recent study in Toronto found that contrary to common public perception, the evidence shows that removing on-street parking to install a bicycle lane or widened sidewalk would likely increase not decrease commercial activity. The study – conducted in July of 2008 – surveyed the opinions and preferences of merchants and patrons on Bloor Street and analyzed parking usage data in the Annex area. The reduction in on-street parking supply from a bike lane or widened sidewalk could be accommodated in the area’s off-street municipal parking lots. The Clean Air Partnership is pleased to invite you to participate in a webinar profiling the findings of the study, the tools and methodology used and a discussion on how a similar study could be conducted in your community. The findings of this study will also be presented in May at Velo-City 2009 in Brussels – the world’s largest conference devoted to bicycling. The study’s lead researcher is an urban planning and policy researcher currently based in Amsterdam. Prior to this, Fred worked as the Project Coordinator and Active Transportation Researcher for the Toronto Coalition for Active Transportation and the Clean Air Partnership. Fred has a Masters in Planning from the University of Toronto. Fred's previous work experience, including time spent with the provincial government, the transit industry, and a transportation demand management association, has consistently aimed at raising the profile of more sustainable modes of transportation and promoting travel choice alternatives to the private car. This webinar is offered to participants free of charge. Participation is limited to the first 40 registrants. To read the study report please click here. Support has been provided by a grant from the Toronto Community Foundation. The Clean Air Partnership would also like to thank Transport Canada and the City of Toronto for their generous support.